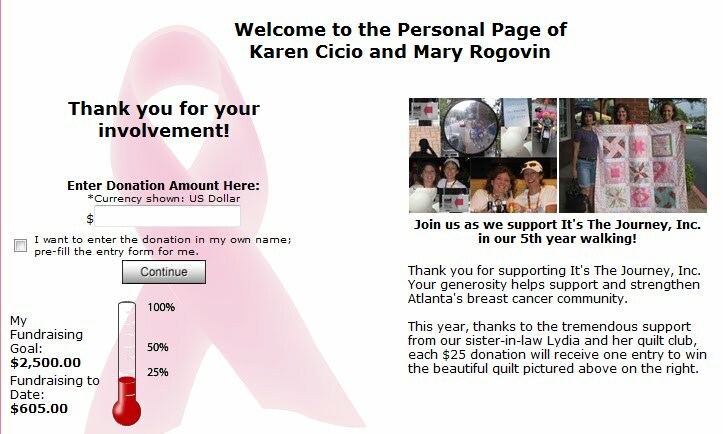 …as in the atlanta 2-day walk for breast cancer. karen and I signed up for the 2010 walk last fall – as soon as registration opened (on the 2nd day of the 2009 walk). yes, the event is that inspiring and the organization it supports is that worthwhile. in its first seven years, It’s the Journey, Inc., who sponsors the walk, has raised $6.6 million and award 107 grants to local breast cancer organizations in the greater atlanta area. last year alone, they awarded a record $1 million to local breast cancer organizations that provide diagnosis, education, support and research on behalf of thousands of atlanta-area men, women and children affected by the disease. we love that the money stays in the atlanta area, and that, with the support of our family and friends, we’ve contributed nearly $10,000! this will be my 4th year walking and karen’s 5th. sharing those 30 miles with karen, walking through downtown atlanta, midtown, peachtree hills and who knows where else (we won’t know the route until the walk begins) makes the whole thing that much more special. the walk is october 2&3, but we have to raise at least $2,000 by september 11. we sent our our first fundraising email two weeks ago and the response has been fantastic – we have $605 collected and another $500 “in process”. we are so fortunate to have such generous (and prompt!) family and friends! and while we’re confident we’ll get that last $905, we certainly appreciate any and all support! 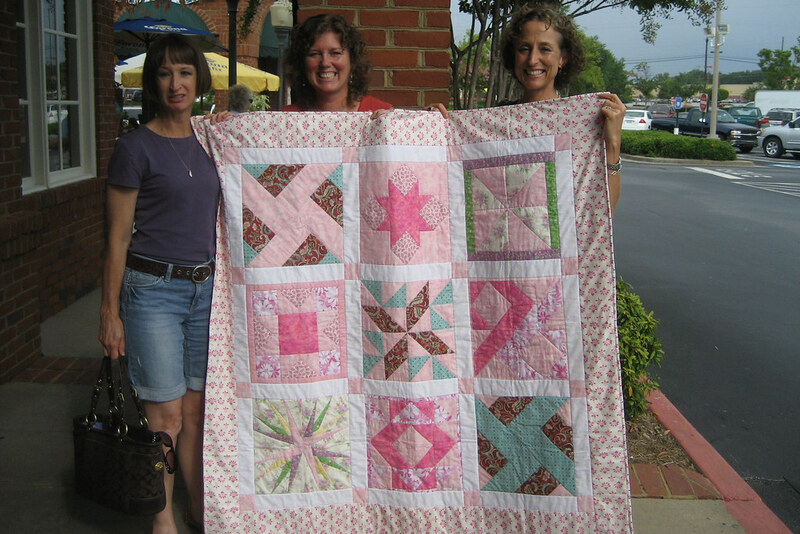 our sister-in-law lydia and her quilt club have stitched a beautiful pink quilt – and donated it to support our fundraising. each $25 donated will receive one chance to win it. I’ve added a link to our donation page and the thermometer to show our progress in the sidebar to the right. admitting I’ve become a bit obsessive about checking the donation total and having it here will make it easy! So you walk through Atlanta. Neat. I pictured you all walking out in the country somewhere. Not sure why I thought that. That was so nice of Lydia and her quilting group! this is such a great cause-keeping it local is what i like the most about the organization-will be getting our donation in soon. i know you'll meet this goal. I'm definitely doing the 2 day next year! By the way, that quilt is absolutely amazing. Hooray for you and your feet! I lost my Mom to bladder Cancer. Heading over to your donation page, right now. Hugs! !